Realism was an art movement that revolted against the emotional and exaggerated themes of Romanticism. Artists and writers began to explore the reality of every day life. When was the Realism style of art popular? The Realism movement lasted around forty years from 1840 to 1880. It followed the Romanticism movement and came before Modern Art. What are the characteristics of Realism? Realism artists tried to depict the real world exactly as it appears. They painted everyday subjects and people. They didn't try to interpret the setting or add emotional meaning to the scenes. This painting is a great example of realism. It shows three peasant women gleaning a field for some scraps of wheat. They are bent over in hard work in the hope of finding a tiny bit of food. This painting was not well received by the French upper class when it was first exhibited in 1857 as it showed the harsh reality of poverty. The reality of this painting is in stark contrast to Romanticism. The three women are dressed in their country clothes and the landscape is rough and a little ugly. Even the cows are scraggly looking. The rich lady is handing some money to the poor girl while the others look on. Courbet was criticized for the "reality" of this painting, but that was what he found beautiful and was trying to capture. In this painting Winslow Homer shows a hungry fox hunting in the snow for food. At the same time there are ravens which are so driven to hunger they are hunting the fox. There is nothing heroic or romantic about this painting, just the reality of what happens in the winter to hungry animals. Gustave Courbet - Courbet was a French artist and a leading proponent of Realism in France. He was one of the first major artists to use art as social commentary. Jean-Baptiste-Camille Corot - A French landscape painter who moved from Romanticism to Realism. Honore Daumier - A French painter who was more famous for his caricatures of famous people while alive. His art became famous after he died. Thomas Eakins - An American Realist painter who painted portraits as well as landscapes. He also painted unique subjects like The Gross Clinic which showed a surgeon operating. Winslow Homer - An American landscape artist known for his paintings of the ocean. Edouard Manet - A famous French artist who, at the forefront of French painting, began the movement from Realism to Impressionism. 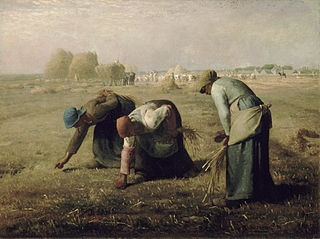 Jean-Francois Millet - A French Realist painter famous for his paintings of farm peasants. The Realism movement started in France after the 1848 revolution. Unlike some other artistic movements, there was little sculpture or architecture as part of this movement. Near the end of the Realism movement, a school of art called the Pre-Raphaelite Brotherhood immerged. This was a group of English poets, artists, and critics. They felt the only true art was the High Renaissance. The invention of photography in 1840 likely helped to spur on the realism movement.